Charente Maritime reputedly has the second sunniest climate in the whole of France. The countryside here is beautiful with rolling hillsides covered in vines, extensive walking, horse riding & cycling trails, forests, historic towns & villages and bountiful local produce. Montendre also has a large boating lake surrounded by forest trail. Plenty of interesting outdoor pursuits including an outdoor gym, sailing, fishing & a large outdoor swimming pool with wave machine. Montendre also has a lovely nine hole golf course & there are riding stables on the outskirts. Montendre Lac is also the home to an annual music festival showcasing French & international bands including in recent years The Kaiser Chiefs & Franz Ferdinand. Between Montendre & the Gironde estuary the land flattens out and is covered in forest & agricultural land. This area crosses into the Bordeaux wine appellations of Côte de Bourg & Côte de Blaye, both excellent wines. There are many vineyards open for wine tastings & tours. We are not far from Cognac & much of the wine in our area is taken to make that little tipple. As well as wine & Cognac, the area specialises in a drink called Pineau de Charente, a beautiful fortified wine which is usually drunk chilled as an aperitif. Montendre & it’s surrounds host a wide range of restaurants, everything from pizzas & crepes to fine dining & French country cooking. You’ll certainly not go home hungry if you choose to eat out here. Our favourite is La Quincaillerie, a Michelin recommended restaurant in the heart of Montendre who are more than happy to cater for vegatarian diners (still quite rare in rural France). For a more relaxed atmosphere the bar/restaurant Chez GiGi is a fair walk or 5 minute drive from the Gite. The menu is small but the food is great & there is live music most weekends through the summer months. See the gallery for pictures. A short drive away the town of Cognac hosts many of the famous cognac distilleries, most of which are open for excellent tours & tastings. 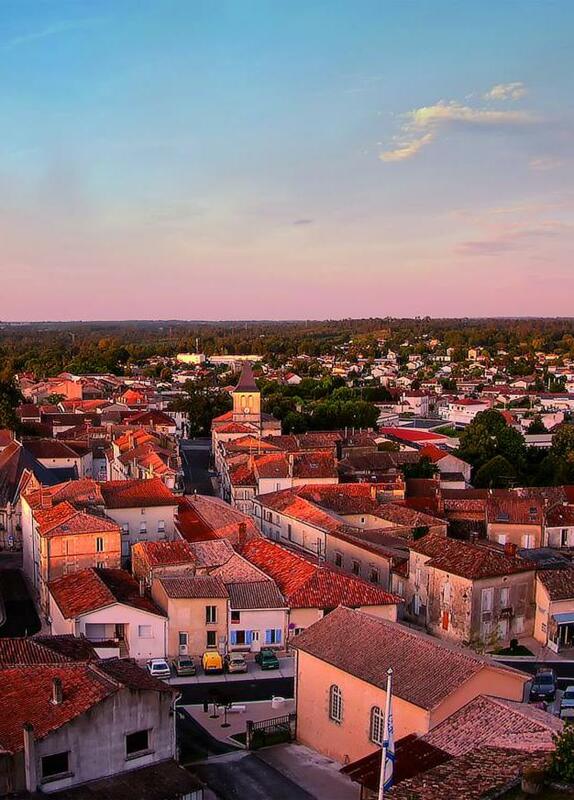 The old quarter dates back to medieval times, the Charente river flows through the town & there are many bars & restaurants with a great range of food served on sunny terraces. There are many beaches within a short drive, the biggest of which are at Royan & St Georges de Didonne on the Côte de Beauté. A little further afield day trips to Archachon where you can see the Dune du Pilat ( the largest sand dune in Europe), Île de Ré, the famously beautiful island off the coast at La Rochelle & the Atlantic beaches of the Médoc Are within easy reach. Travel through the vineyards to the banks of the Gironde. Blaye is famed for its wine and the historic fortress Blaye Citadelle, part of the fortifications that protected the important trading centre of Bordeaux further downstream. The Citadelle is worth a day out on its own. The large Fortress was built in the 17th Century, protection from the marauding English! Now the Citadelle hosts a hotel, restaurants and boutiques selling arts & crafts. From Blaye you can also take the short ferry trip to the Médoc, another beautiful area filled with the vineyards & stunning Chateaux of this famed wine area. Other days out could include the beautiful medieval town of St Emillion famed for its wines, Talmont a fortified village on the Gironde estuary established originally by the English during the Hundred Years War. Talmont lies about half way along a wonderful scenic drive along the estuary where you’ll find many lovely restaurants in the small port villages. Both Angouleme & Bordeaux are beautiful cities to visit, both under an hours drive so really right on your doorstep here. There is so much to see we are sure that one holiday won’t be enough!